← Delta #EpicFail Noble Subdivision : Gold Band Finance —The Little Finance Company that did (Delta). Delta #EpicFail Noble Subdivision : A Dog, or a RAVING YAPPER?…. Wed, 2 Mar 2016 at 12:50 p.m. Your correspondent today was intending to provide his further investigations and suspicions as to what was in fact really happening with the “mortgagee sale” process at Noble, and what they are up to. Pausing here : The term “mortgagee sale” is used in the loosest possible way. Your correspondent has been at work on this, and as the trail to the mortgagee sale has unfolded in recent posts, your correspondent now thinks he has taken What if? readers down a couple of dead ends in an early post or two concerning where Delta may have ranked and what Delta / DCHL are plotting…. He made the mistake of thinking a mortgagee sale was in fact a true arms length mortgagee sale, where security holders went to the market to sell a distressed asset, at whatever price the market saw value at. That is the consequence of seeing through the glass darkly, with a group of men determined to keep secrets, but your correspondent has enlisted some help, and reckons he now has the measure of Delta’s machinations in regard to their ultimate plan. Readers may be surprised to hear that your correspondent has no personal axe to grind with any of the public figures he has lampooned, merely that on the facts some of them are unfit to occupy the positions they do. Over a cup of tea, it has been decided to give DCC and Delta a chance to respond to the recent posts by releasing clear information about what has happened and what plan Delta / DCC has to exit the Noble Subdivision. While any Delta / DCC disclosure will be a lot less entertaining than this correspondent (even if I say so myself….) we must sacrifice humour for accuracy at this critical juncture. It is a critical juncture because this correspondent believes if pressure is not brought to bear on Delta / DCC now, a fait accompli will be soon presented that is going to involve more public funds at risk. Mr Crombie will assume a sombre tone, and announce that there was no option. He will become TINA Crombie. – There Is No Alternative. As Justice Brandeis said ‘sunlight is the best disinfectant’ and all of Dunedin deserves precision as to what is going on. Of course, as What if? readers will know, if the Delta / DCC does not respond to the kind and gentle approach (we must give them a chance, readers) there are other avenues presently being explored…. Mayor Cull’s lack of transparency is extremely concerning, and is an indicator to what is happening. If indeed there was a proper mortgagee sale process occurring with negotiations with multiple bidders unrelated to Delta / DCC, there is absolutely no reason why he could not confirm that. This correspondent thinks he cannot because it isn’t true. Blatant falsehoods have a habit of being discovered. Your correspondent is not a proud or vain man – (well, his wife may not agree) – he and most of Dunedin would be very, very happy if he was proven to be quite wrong, and Delta’s plan did not involve any further public funds. This of course doesn’t make the previous Delta ineptitudes go away. To labour the point : The directors must be held to account. Today, instead of the headline act, we will tease out some of the implications of the Delta decision to continue work on the Noble Subdivision in December 2009, when the variation to the consented subdivision was revealed to them and they continued on. This was the critical decision that led to Delta backing up a truckload of dollars off Yaldhurst Rd and tipping it into the freshly excavated ground at the Noble Subdivision. (Your correspondent likes earthmoving metaphors as much as the next man). Quite apart from the ethical and legal considerations arising from committing a major offence under the Building Code, this correspondent believes this was also a very bad financial and strategic decision. At that point, with Delta refusing to work, with the subdivision going nowhere Gold Band Finance would have been much more amenable about selling their entire first security interest. It was at a time of low confidence post GFC (global financial crisis) and the Gold Band Loan was not increased with a lot of penalty interest charges. Getting rid of Gold Band should have been job #1. Gold Band had not at that point been put through the wringer by their Trustee. This point is not to be taken lightly. The breaches of the trust deeds caused an enormous amount of stress to Gold Band. Gold Band were far too small to be able to finance the development phase of the subdivision, but had the all important first security. What Delta needed was a financier who could finance the construction phase, always the hardest phase of a development to fund, and provide a tripartite agreement (TP). This would have provided certainty of payment from the financier as long as they didn’t go broke. But Delta (and their Directors are to blame for this) were too inexperienced or too dense to see that Gold Band hogging the first mortgage security with a trifling amount were the biggest risk to Delta. Delta were also too dense too see that by taking enormous risks, and spending enormous amounts of public funds, all they were doing was strengthening Gold Band’s first ranking security position and making their desire to leave less and less, as some of the (alleged!) value they were creating with the work onsite was captured in very expensive and profitable capitalised interest and eventually default charges for Gold Band. That is probably why Gold Band made them pay over the odds for a share of the first mortgage in August 2013, as discussed in yesterday’s post. Delta management may have thought tripartite agreements were something that Otago Students were given at O week. Any other larger civil contractor with proper processes in place working for undercapitalised developers such as Noble, without exception would have absolutely required a TP direct from the funder. It is a do not pass go item. Private companies such as Hogan, Downer, McConnell Dowell, Higgins insist. But not the council controlled Delta. In a fit of monumental short-sightedness they believed the gain of getting some work at slightly higher than market value was worth risking public funds to finance the deal, with a highly questionable developer. What Delta were acknowledging was that the only way they could get meaningful work at any sort of return was to risk public funds, going where no bank or even finance company would go. The enduring questions is that how on earth did Delta directors not look around and think : Why are there no parties of substance to this deal ? No banks, no mezzanine funding? We, Delta, are the strongest link here in this 300 lot subdivision ! If Delta had refused to continue work on the unconsented scheme, no other contractor would have touched it. It would have stopped. Noble would have then applied for the varied consent with very little physical work done. It would be inevitable that the changes would either be turned down by Christchurch City Council (CCC) or at least publicly notified to a very peeved Yaldhurst community and mired in appeals far into the future. At that point, being undercapitalised both Noble and Gold Band could have been pushed to the door marked Exit, if they saw either years of appeals or continuing on with the consented scheme and making no money. That would have been a good thing, a stronger credible developer (Mr Carter, anyone?) would have eventually stepped in, banks would have got involved and the all important TP. Even perish the thought, Delta could have offered some favourable LIMITED deal to secure the work. Delta might still be building roads in Christchurch. This would have all happened pre earthquake. 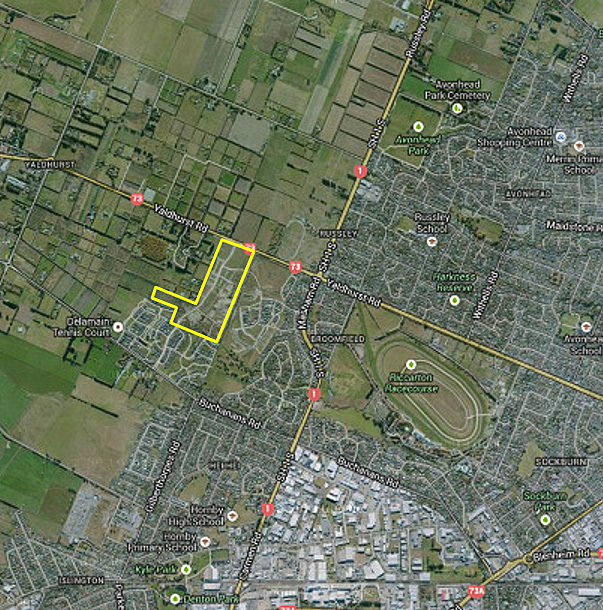 The subdivision, could have been perfectly poised post earthquake. Instead it was mired in legal messes. The earthquake was a bad thing for Delta because it gave Gold Band and Delta false hope that they could continue to turn a blind eye to the toxic cancer that was Noble and all that it touched. They both thought that the huge demand for land post Earthquake would save them. They didn’t realise that if it looks like a dog, and acts like a dog, then it is a dog. In fact as it was hilariously described to your correspondent today by a distressed asset specialist, “Dear CD, this subdivision isn’t a dog, this is a RAVING YAPPER” (emphasis is the specialist’s). If Delta had stopped on December 2009, as they should have, the maximum loss would have been two months of site clearing and excavation work. If they just walked away, and wrote it off to experience it might have been a few hundred thousand, but nowhere near terminal. They would have lived to lose money another day. The present state of the residential market in Christchurch and how it affects Noble and the likely Delta recovery will be discussed in a further post. My evil suspicious mind started checking out directors of various involved companies and looking for who were directors of what, and who owned shares in which as so on. Because I simply refuse to believe the movers and shakers and decision-makers at Delta were that stupid. So what might these people have had in mind if they were/are not stupid? A tails I win/heads you lose scenario. So it doesn’t matter what happens, what the market does, what the GFS does – they ALWAYS win. How can that be arranged? If a business does well, terrific. If it doesn’t do well, it may very well be sold at a loss. Which is someone else’s profit. Someone who knows this sale is going to happen and has the cash ready to buy. And the buyer has to be someone with no traceable connection to the loss maker. Pure speculation on my part and it’s in the public interest that there should be sufficient scrutiny to either prevent a council owned company from being used this way. Or caught out if it has been used in this way. Pasted below are some of the sites I googled and excerpts from CD’s latest reporting. I notice that Gold Band seems to be a finance company where investors take considerable risks. So why did Delta use them? It surely couldn’t POSSIBLY be because some of the Delta decision-makers actually wanted this subdivision project to go broke. Surely not. And why (as CD notes) did the Delta decision-makers (whoever they were) continue work when all that was doing was increasing Gold Band Finance’s interest in the project. It surely couldn’t have been that Delta decision-makers WANTED to improve Gold Band’s financial position. Surely not. Well, if the decision-makers at Delta were NOT stupid (and I think not), then anyone scrutinising these machinations would be wondering why the Delta decision-makers would have wanted to give Gold Band a nice present of a large amount of money which Gold Band had really done nothing to deserve or earn. Excerpts from CD’s most recent post which drew my particular attention, followed by the web links. The Directors of the Issuer are Robin Charles Standage, Robin Wales, John Philip Thompson and Paul Alexander Rogers. Martin Brennan is the Chief Executive. The Directors and the Chief Executive are principally resident in Christchurch and can be contacted at our office address (above) or registered office (485 Papanui Road Christchurch). We have three wholly owned subsidiary companies: LoanCo Limited (established 2005), Credit Protection Limited (established 2004) and Aurous Asset Holdings Limited (established 2008). I have no idea who really runs Delta. It seems the only defence for the Delta decision-makers (whoever they might be), if they are claiming that they are innocent of evil financial wheeling and dealing, is to claim that they are financially stupid (!) And unfortunately for them, being financially stupid and continuing to direct, manage or run a company, especially a publicly-owned one, when you don’t have the proper skills to do so, also amounts to fraud. So it looks as it there is a possibility that these decision-makers might now be the ones in a “heads they lose/ tails they lose’ situation. If so, serves them right.